The BTA is proud and pleased to be a supporter of the Changing Places campaign. Working with the Changing Places Charter Group our organisation is hoping to help and assist everyone needing the CP toilets that would help them to enjoy the day to day activities many of us take for granted. Local Government Minister Minister Rishi Sunak MP visited Arsenal FC’s stadium to raise awareness of Changing Places toilets. He met Arsenal fans Thomas, and his mum Barbara, for whom Changing Places are vital for Thomas’s experience at the stadium. 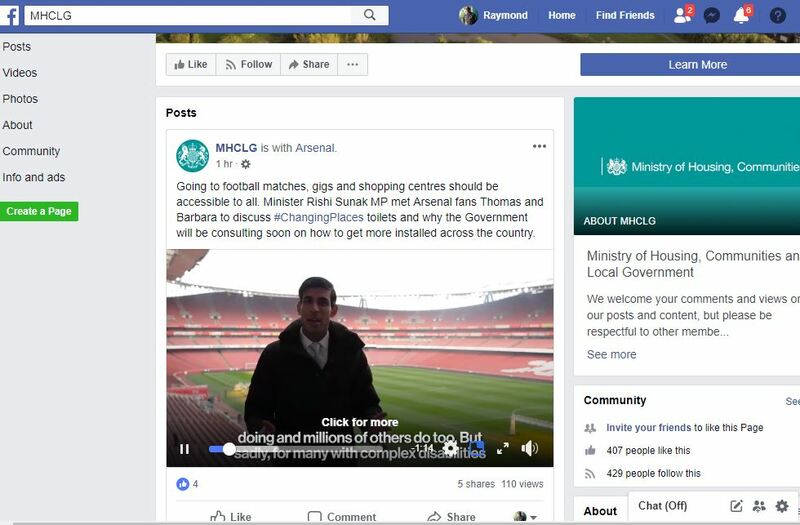 The Ministry of Housing, Communities and Local Government published a social media video from this visit to raise the issue further and highlight the government’s push to get more Changing Places toilets installed across the country. The video was published on our department’s Twitter and Facebook pages. It would be wonderful if we could encourage lots of you to retweet the Twitter post (@MHCLG) and share the Facebook post (/MHCLG) to help to spread the word. The Changing Places Consortium is a group of organisations working to support the rights of people with profound and multiple learning disabilities to access their community. The Changing Places Consortium is campaigning for Changing Places toilets to be installed in big public places. The Changing Places Consortium launched its campaign on behalf of those people who cannot use standard accessible toilets.This includes people with profound and multiple learning disabilities and their carers, as well as many other disabled people. They need Changing Places toilets with enough space and the right equipment, including a height adjustable changing bench and a hoist.